I remember the promise of Episode One as it neared release. Not only would The Phantom Menace be the first new Star Wars movie in sixteen years, it would tell the story of a previous generation of heroes. Set in the days of the Republic, it would feature Jedi in their prime. Sure, Luke Skywalker was a cool Jedi Knight in Return of the Jedi, but he was barely trained. The thought that Jedi Masters would be gracing movie screens was exciting. The obvious expectation was that Obi-Wan Kenobi, the mentor to both Anakin and Luke Skywalker, would feature in these films. And, he did. However, it was his mentor, Qui-Gon, that was the first full-fledged Jedi of the prequels. Beyond being the first, Qui-Gon Jinn was significant for many reasons. One of the most significant things about Qui-Gon was that he discovered Anakin. At first, he was impressed with Anakin’s good and charitable nature. He offered them shelter from the oncoming sandstorm in Mos Espa. When Anakin revealed he was able to pilot a pod racer, Qui-Gon began to suspect there was more to this slave boy from Tatooine than met the eye. It was Shmi’s confirmation that Anakin that didn’t have a father that fully aroused his suspicions. However, it was also was notable how Qui-Gon went about confirming this suspicion. He took a blood sample, without permission and under false pretenses I might add, and had Obi-Wan scan it for midichlorians. Obi-Wan’s scan revealed that Anakin had a number that was off the charts and more than those of Master Yoda. This is unusual. Think of how potential Jedi were revealed before and have been revealed since then. Yoda and Obi-Wan just knew Luke was gifted with the Force. In Rebels, Ezra and Kanan managed to identify each other as Force users through a tingling in the Force itself. In The Force Awakens, Rey’s Force powers emerge on their own. As if that wasn’t enough, Qui-Gon made an intuitive leap. Upon receiving the results of Anakin’s midichlorian screening, Qui-Gon became suspicious that Anakin might be the “Chosen One” destined to bring “balance to the Force” according to the old Jedi prophecy. His suspicions were confirmed in his mind after Anakin won the Boonta Eve Classic. Qui-Gon then championed Anakin for Jedi training as the Chosen One when the other Jedi were apprehensive. Obi-Wan would have preferred to leave Anakin behind. Yoda and Mace Windu sensed fear and danger in the boy. Qui-Gon was steadfast in his defiance. It was that defiance that allowed Anakin to travel to Naboo and participate in the battle there. His participation cemented a home in the Jedi Temple and a spot in the Jedi Order for him. 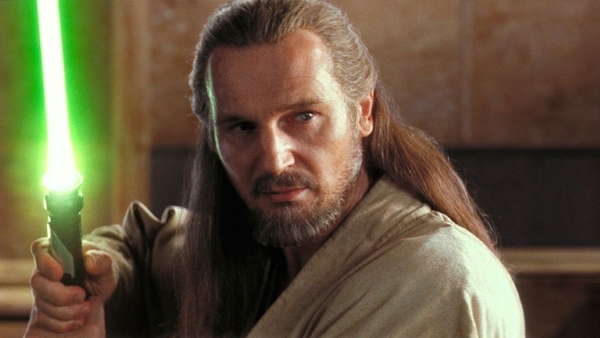 Qui-Gon was the first Jedi Master audiences had seen that was in his prime. When Obi-Wan was introduced in A New Hope, he was an old man. His duel with Darth Vader aboard the Death Star was sluggish compared to the frenetic fights that Qui-Gon and Obi-Wan would be involved in during The Phantom Menace. Luke Skywalker could only claim the title of Jedi Knight at best in Return of the Jedi. Yoda, another Jedi Master, was nearing the end of his life when Luke found him in the swamps of Dagobah. In contrast, Qui-Gon and his padawan were dashing figures. Their lightsaber fighting styles favorably compared to a whirling dervish. They quickly spun, sliced, and slashed their way through scores of battle droids on the Trade Federation battleship. At the height of his powers, Luke Skywalker would take on an entire sail barge of Jabba’s minions, but his pace was slow and plodding by comparison. In addition, Qui-Gon and Obi-Wan demonstrated a greater competence in their Force abilities. Force enhanced speed, leaping, suggestions, and telekinesis were used far frequently, and usually with greater effect. Qui-Gon lead the charge against Darth Maul even though he didn’t survive the battle. It was the battle prowess demonstrated by Qui-Gon and Obi-Wan that gave credence to the legend that Jedi were incredible warriors during the original trilogy. From its beginnings through Return of the Jedi, the Force had largely been described in terms of light and dark. Obi-Wan noted the Force was what gave a Jedi his power. Yoda described the Force as existing between all things, particularly the living. He noted that the dark side was no more powerful than the light, just quicker and more seductive. On the flip side, Darth Vader extolled the power of the dark side. Qui-Gon had a different view. Qui-Gon followed the living Force. He would remind his padawan, “Don’t center on your anxieties, Obi-Wan. Keep your concentration here and now, where it belongs.” While he should be mindful of the future, it should not come at the expense of the moment. To follow the living Force, one should live for the moment, reaching out with feelings, and relying on instincts. While he believed in the existence of the Sith, he didn’t speak in terms of light and dark. One needed to be mindful of the living Force. Perhaps this is what guided him to Anakin. And, perhaps Qui-Gon should have been more mindful of those aspects of Anakin’s personality that Yoda feared. An attention to the lure of the dark side might have prevented Anakin’s fall. However, it might be argued that if Anakin had followed Qui-Gon’s advice and lived in the moment and not centered on his anxieties about the future, particularly about the fate of his dear wife, he might not ever have fallen to the dark side. Qui-Gon’s fate was not to survive beyond the events of The Phantom Menace. Then again, it was through the living Force that he was able to preserve himself as a Force ghost. Sure, additional adventures of Qui-Gon were told in the old Legends material, and he has shown up briefly in The Clone Wars. However, it would be interesting to learn more of Qui-Gon’s path. The canon has been reset, so why can’t we revisit the original Jedi Master once again? Next article Check Out the Latest 'Comic Book Galaxy' by CWK Co-Host Dan Z! Previous article CWK's Dan Z Talks to Honor The Force About Star Wars, Podcasting, and More!